“Dreams and schemes and circus crowds”. These are words from Joni Mitchell’s “Both Sides Now”. They can evoke many different kinds of reactions and responses from the audience and the song has been an inspiration for a lot of my work. My theme for my current wall exhibit at Off Track Gallery is “Dreams and Schemes”. Much of my work contains areas of mystery….some intentional and some resulting from happy accidents. 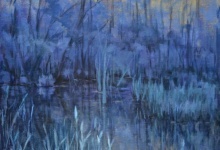 “Marsh Mystique” started as one of my “Sanctuary” series paintings. My intention this time was part of a set of color “Scheme” experiments. I used a limited palette with the Complementary colors yellow and violet. As I was rendering a scene in the Tillman Marsh, a “happy accident” was occurring in the background and I began to question what was happening there. A lost city perhaps? I thought I’d leave the element of mystery there and leave it to the imagination of the audience. 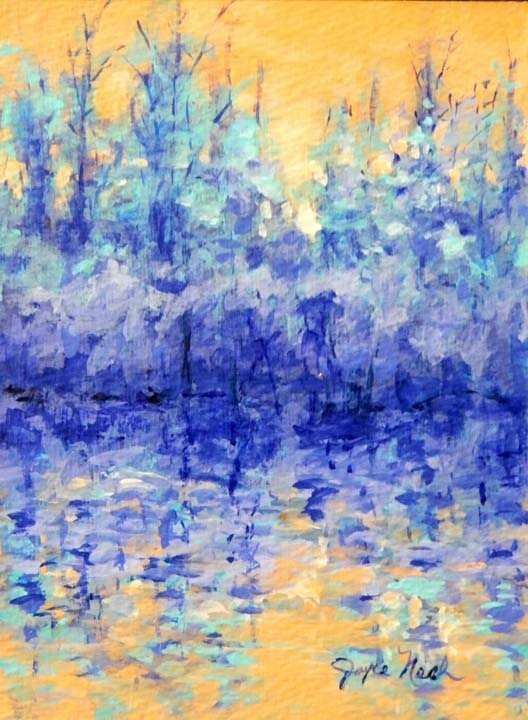 Another painting on this wall using this complementary color scheme is “Sanctuary 16” which at first glance is a purely representational rendering of the marsh. Here I tried to create a dreamy quality with paths of very dark values of violet to lead the observer further deep into the darkest, most mysterious areas of the marsh. 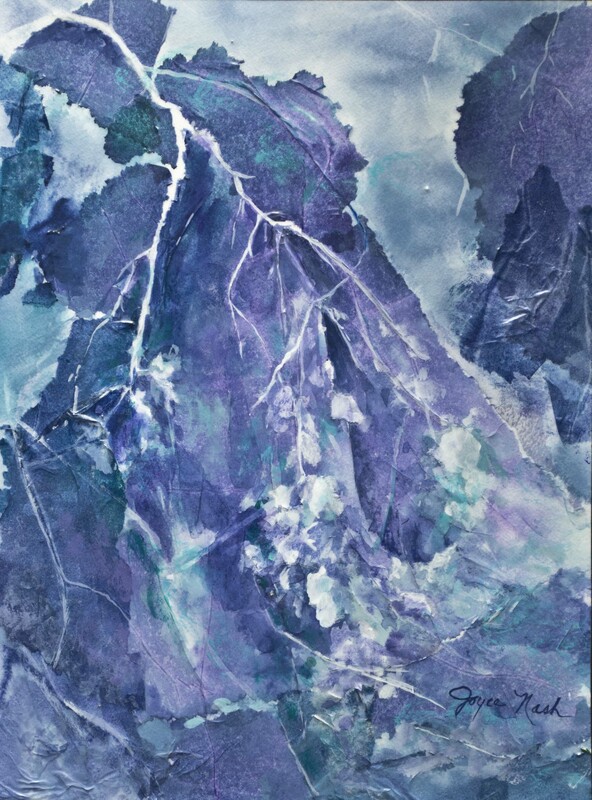 “A Dream in Violet” began as a fairly realistic rendering of eucalyptus tree branches using an analogous color scheme with shades of blue and violet. 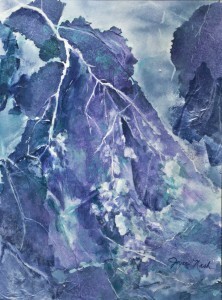 I started with torn pieces of stained tissue paper all the time working from reference photos of eucalyptus branches. 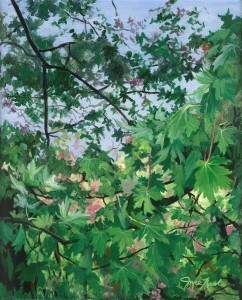 As I started to define the leaf shapes, I noticed stories forming in the background areas. 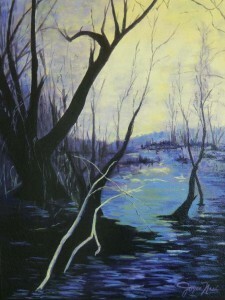 I could have rendered them to suit my interpretation but decided to allow those areas to keep a mysterious abstraction. I left the interpretation to the observer. “Sanctuary 27” also uses this analogous color scheme. I wanted a monochromatic color scheme for “Blue Marsh”. 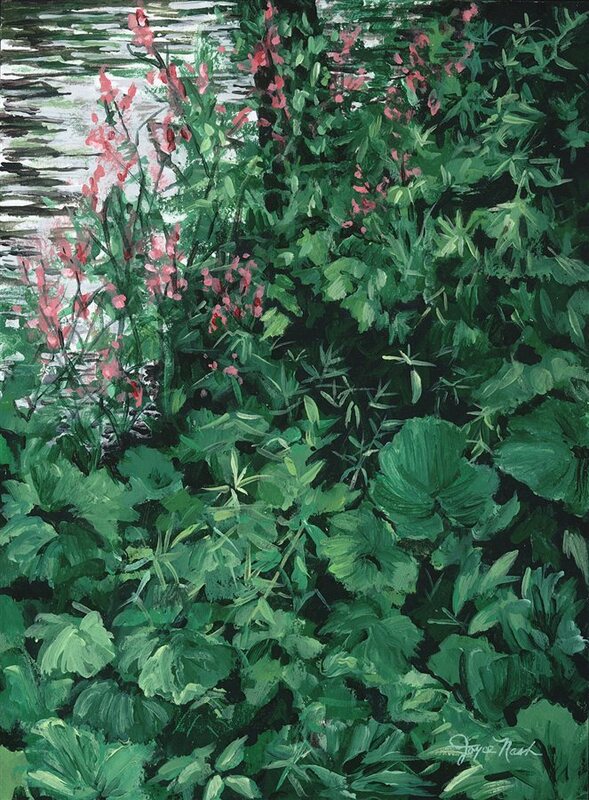 It is meant to convey a thoughtful, meditative, tranquil mood. I don’t mean any sadness here and wanted the Canada Geese to be a “couple”, together, and definitely not sad. I chose blue because I like it. 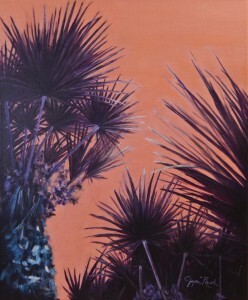 Another limited palette scheme I’m using in this exhibit is seen in “Purple Palms”. It could be labeled an analogous scheme of red orange, red and red violet. I did not use pure red at all but there is some of its complement green. My main point of interest here was the pattern created as the palm fronds crossed each other. I wanted the negative red orange spaces to pop and entertain the observer. The lyrics to “Both Sides Now” inspire a lot of themes for me. 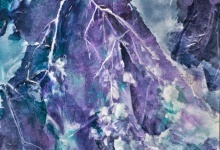 I’m currently working on a series of paintings using clouds. There are lots of possibilities here. Sunrises, sunsets, of course. But how about “Ice cream castles in the air”? Let me surprise you. 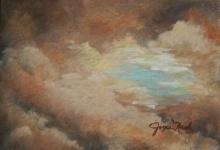 In this exhibit, on display at The Off Track Gallery though March 30, I invite you to “Just Breathe”. 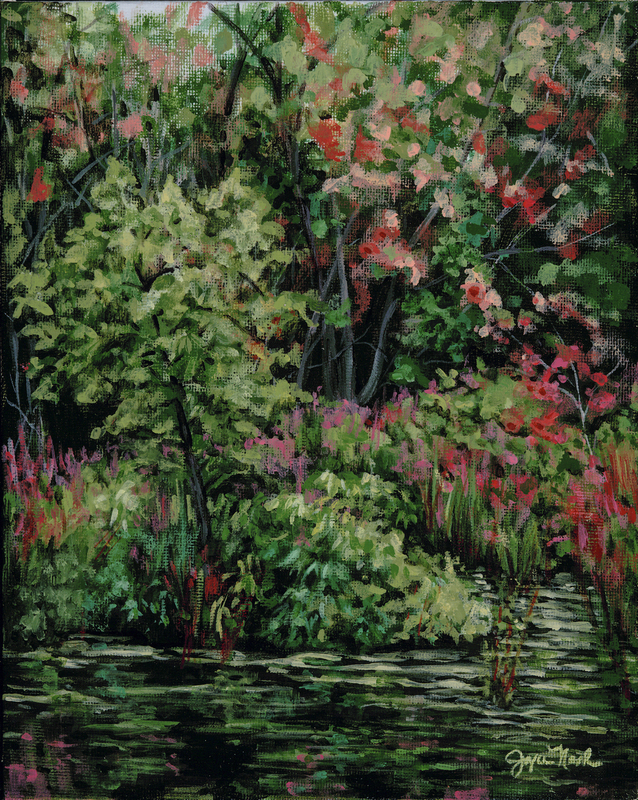 The paintings featured are part of my successful “Sanctuary” series, inspired by the serenity of the Tillman Marsh in upstate New York. It’s a terrific place to meditate, relax and for me, to draw and take photos. Wild Thing III” and “Wild Thing IV” portray the marsh during mid-summer. The “Wild Thing” refers to the tree on the left side which always seems to want to go in its own direction, no matter what the season. 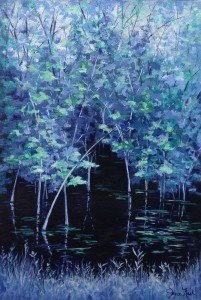 The analogous color schemes of “Blue Marsh” and “Sanctuary 27” invite you to meditate on the tranquility and mystery of the settings. 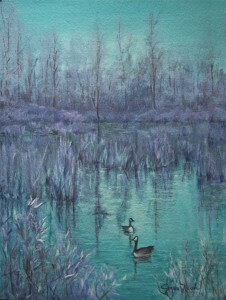 The Canada Geese which are common to the area are often featured in this series and have become a symbol of the place for me. 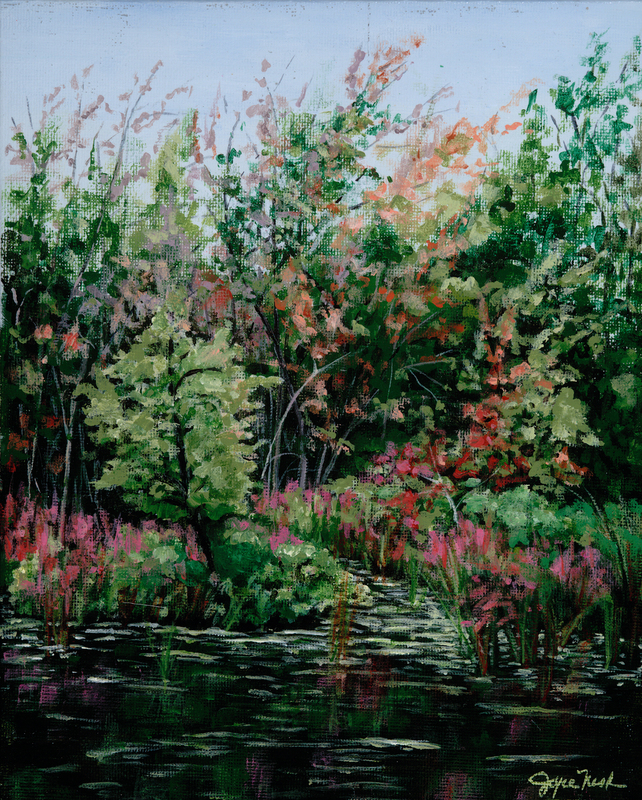 Tillman Wild and “Wishbone” render the colorful and lush plant life of the marsh, abundant, despite the harsh winters of the area. 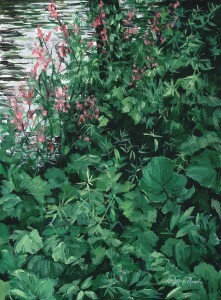 I love painting water and many of my paintings include water in some form. kinds of emotion. 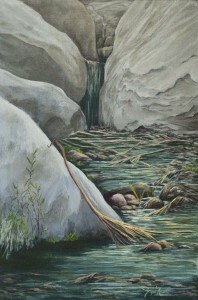 Water can be the center of interest in a work of art or a supporting element in the composition. “Bridge at Letchworth” represents a scene from a state park in upstate New York. 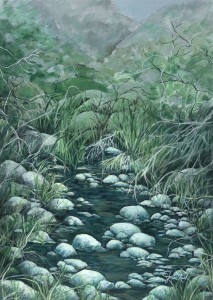 I loved the way the brook flowed over the rocks and stones. Another of my favorite sources is the marsh at Tillman, also in upstate New York. Whenever I visit the area, I stop by the marsh because it is so tranquil and evokes thought. “Wild Thing” based on that marsh. The Wild Thing refers to the off center tree in the center which always appears to me to be the rebel of the marsh…going its own way. The water in the marsh is usually still, the tranquility of that broken only by the Canada Geese which are very present in the area. “All Quiet” and “Big Sur III” have the ocean as the main feature of the painting as most of my seascapes do. My intent here is to show how peaceful the ocean can be and how appropriate the name “Pacific” is for this ocean. 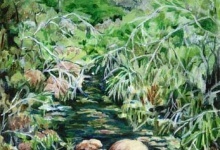 One of the best reasons to paint water is that the artist can utilize water features to evoke a wide range of emotion and I hope that this selection of “Water Features” will do that for you. 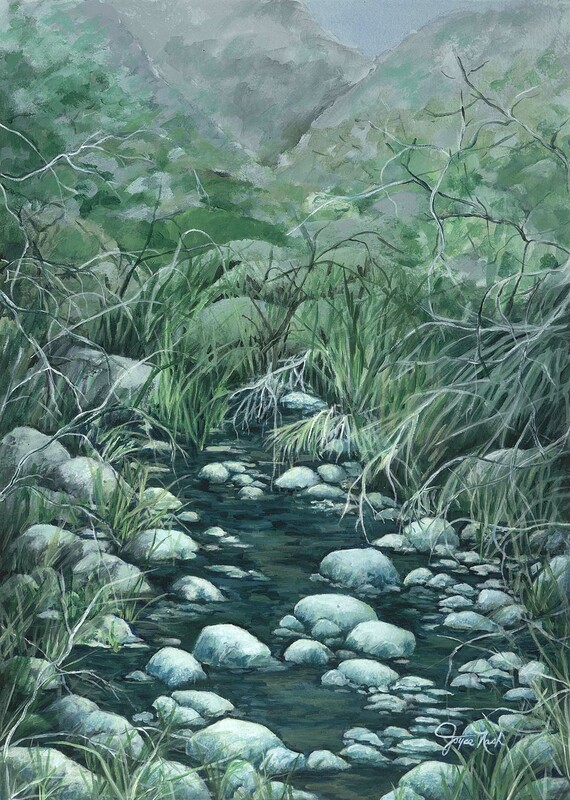 I love painting water and many of my paintings include water in some form. Whether a stream or waterfall, brook or lake, ocean or river, water can inspire all kinds of emotion. 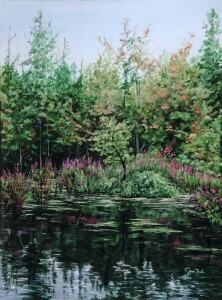 Water can be the center of interest in a work of art or a supporting elem ent in the composition. 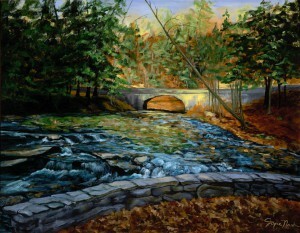 “Bridge at Letchworth” represents a scene from a state park in upstate New York. I loved the way the brook flowed over the rocks and stones. Another of my favorite sources is the marsh at Tillman, also in upstate New York. Whenever I visit the area I stop by the marsh because it is so tranquil and evokes thought. “Wild Thing” based on that marsh. The Wild Thing refers to the off center tree in the center which always appears to me to be the rebel of the marsh…going its own way. The water in the marsh is usually still, the tranquility of that broken only by the Canada Geese which are very present in the area. 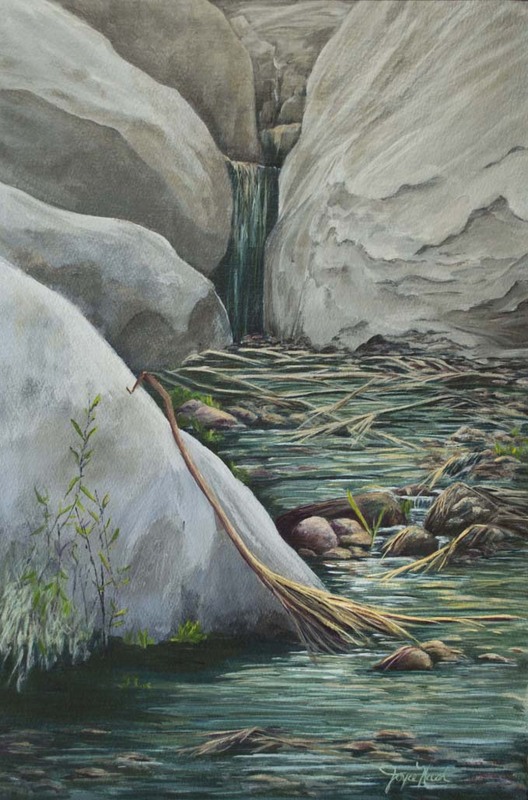 One of the best reasons to paint water is that the artist can utilize water features to evoke a wide range of emotion and I hope that this selection of “Water Features” will do that for you. This exhibit is now on view at The Off Track Gallery through November 25, 2015. 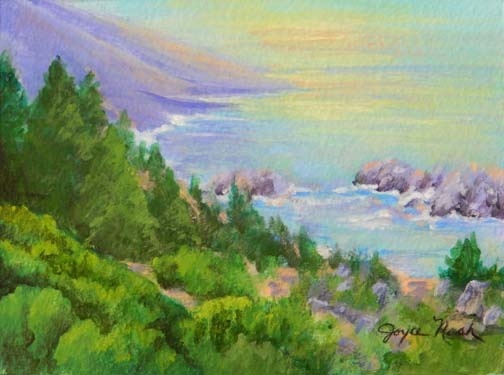 Joyce is a Featured Artist during October and November at The Off Track Gallery in Encinitas. She is exhibiting “Water Features”, several works depicting streams, brooks, the marsh and the ocean. 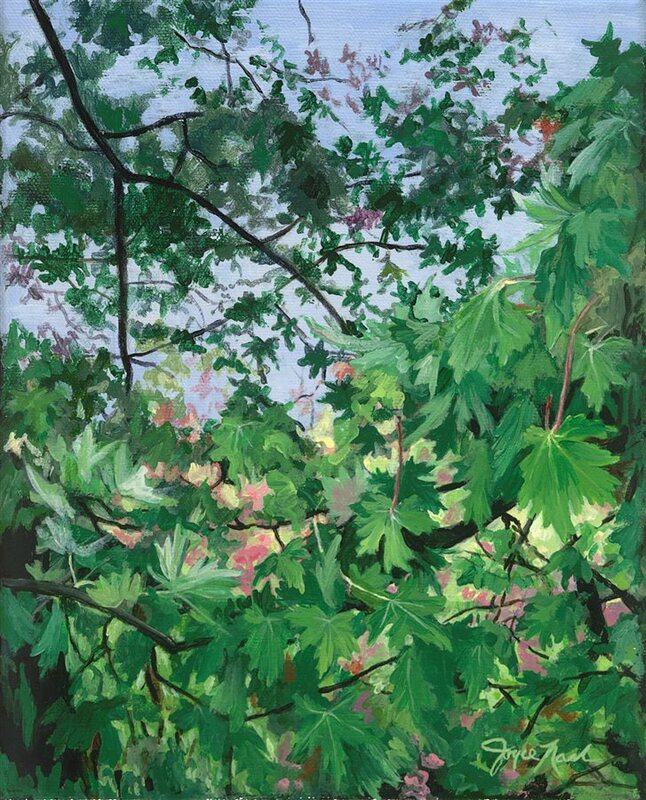 The public is invited to a reception on Saturday, October 10, 2015, from 3:00 – 5:00 PM. Joyce will also be at the gallery on Sunday, October 11, from 10:00 AM – 2:00 PM. 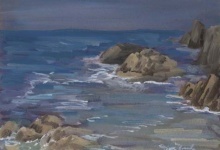 The gallery is located at The Lumberyard Mall, 937 S. Highway 101 in Encinitas. 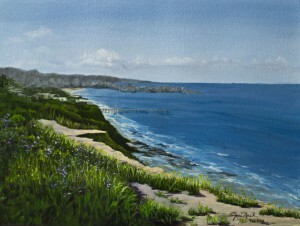 I am very pleased to announce that I now have prints and cards available at The Off Track Gallery in Encinitas. I also have card sets available at The San Diego Watercolor Society Gallery in the NTC Promenade, Liberty Station, Point Loma. You can also purchase cards and prints in the sizes you specify online at Fine Art America, www.fineartamerica.com. Joyce received a Second Place ribbon for her painting, “Purple Palms” in the San Dieguito Art Guild May Membership Show juried by Richard Stergulz. 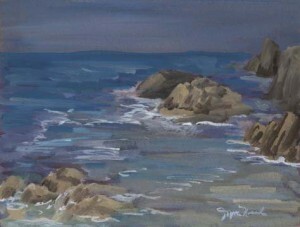 This painting is on display at The Off Track Gallery in Encinitas through May 26. 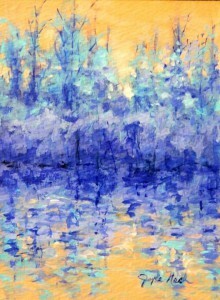 See this painting along with several examples of work from her popular “Sanctuary” Series. 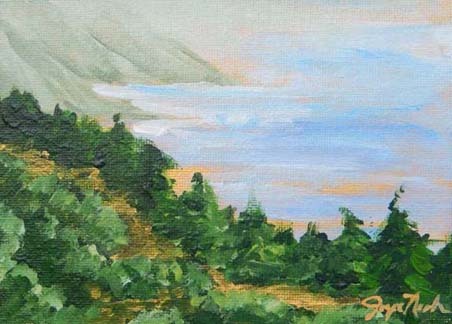 Joyce’s painting, “La Jolla Farms IV”, one of the two paintings she had juried into the annual NCSFA juried show, was awarded an Honorable Mention.